When I moved to Memphis, I remember that everyone used to tell me that if I wanted to see the best cross-section of Memphians, I should go to Jerry’s Sno Cones. And I quickly learned they were right. Teenagers, young families, businessmen in power suits, businesswomen in power suits, the elderly—it seemed that Memphians couldn’t get enough of this establishment that brought the people together. I didn’t think there was a place that could rival Jerry’s in this regard—until my first shift at the Repeat Boutique. I have always had a secret desire to work in retail, and there’s nothing more fun to me than hanging clothes and organizing them—you should see my closet! So as I marched in for my first fund development shift as a provisional, I expected the hanging and the organizing. What I didn’t expect was the community inherent in the Repeat Boutique, and the wonderful time I would have working there. Ms. Gracie and Ms. Jackie are spitfires—warm, engaging and quick-witted, they are always thrilled to have enthusiastic helping hands. I spent my first shift at Repeat Boutique hanging clothes that had just been dropped off by someone who clearly did not understand what was appropriate to donate. After we had deposited over half of the clothes into the “church pile” (including a number of tops that were not discernable between a tank for a child and what an adult woman would wear to a club…yes, they were that small), Ms. Jackie and I finally got to sort through the rest of the treasure. There was little notable about this, except the number of customers who peeked their heads into the service window to check on Ms. Jackie and tell them about their week. I loved listening to the gossip, the catching-up, the banter and the obvious way that the Repeat Boutique served as a family to these patrons and to Ms. Jackie and Ms. Gracie. Toward the end of my shift, I emerged from the back to help hang clothes and organize what was already on the floor. And that’s when I got to see the cross-section I mentioned earlier. The peekers who had stopped in to chat were only the surface of the depth of the clientele at the Repeat Boutique. College students, suburban moms looking for a deal, parents and guardians alike shopping for school clothes for children and grandbabies (often with the kids in tow)—they were all there. I immediately struck up a conversation with an older gentleman who was trying to shop for a job interview he had that Monday. He hadn’t been employed full-time in nearly a year, and he wanted to be sure he looked the part. I helped him “dress for success” that afternoon, and I left the Repeat Boutique feeling like I had been helped as much as I had helped. What a special place this was; and so much more than just clothes or a shopping excursion. I was almost gleeful when I couldn’t make up a small group meeting and had to do an extra shift at the Repeat Boutique—I didn’t know I was allowed to work more than just my assigned shift (#classicnewbiemove)! Every shift at the Repeat Boutique is an adventure, and one that I find myself looking forward to every time I sign up. Bring food with you!– Seriously, at least trail mix or a granola bar. Maybe even a bottle of water. You will wear an apron with pockets and can easily cart it around with you. But you will be on your feet doing light labor for at least three hours—hydration and food are key! Be sure to bring your donation with you for your shift—and be even more sure that they are on hangers!– I can’t stress this one enough. Are you sick of hangers from your dry cleaners all over your closet? Don’t even think about it—the answer is yes. This is a great way to get rid of them, and to make everyone’s lives at the Repeat Boutique easier in the process. The fact that you won’t have to continually remind yourself to bring your quota later in the year? Just a bonus. We always need men’s clothes and plus-size clothes! !– If there is anything that we run through quickly, it is quality men’s clothes (refer to my “dressing for success” story earlier) and plus-size clothes for women. I have worked shifts where we can barely push the cart out onto the floor before customers start perusing the racks for those two categories of clothing. Ask friends if they have clothes you can donate on their behalf!– This can be a win-win for everyone. You get to satisfy quota or a special sale, and they get to clean out their closet. Hooray! Be ready to “keep your own pile”– One perk of working at the Repeat Boutique is having what I call “first dibs on the good stuff.” Some of the clothes brought into the Repeat Boutique are hilarious and unusable (see: “church pile” above); others are Kate Spade shoes and Coach bags and Crane stationary. I KNOW. I keep a note on my phone with the sizes of some friends or items they’re keeping an eye out for. Show up early for your shift, stay later or work in the back to get the first look at some pretty great buys. Wear comfortable shoes! !– Pay attention to the reminder emails you get from the JLM. You’re going to want to be in a JLM t-shirt and sneakers (and, you know, something on the bottom). You will be on your feet and sometimes doing less than fabulous tasks (including hauling furniture into cars or taking out trash); a Repeat Boutique shift is not the time to bring full glamour. Get ready to have a great time!– Seriously, I love working at the Repeat Boutique. I know the three-hour shift isn’t for everyone, but Ms. Jackie and Ms. Gracie need reliable, wonderful, self-sufficient volunteers who are cheery and industrious. If this sounds like you (and I assume it does, because you’re in the JLM! ), then be sure to sign up for a shift. You won’t regret it—I know I never do! Note: Repeat Boutique is a resale shop operated by the Junior League of Memphis. The store sells gently used clothing, shoes and accessories for all ages; small home furnishings; housewares; and children’s items. Junior League of Memphis members donate most of the items sold at the store, but we gladly accept donations from the general public. Please remember the Repeat Boutique the next time you clean out your closets! As a provisional, I worried that my first month was representative of what my whole experience would be in the Junior League of Memphis (JLM). Was I going to spend the entire year (or worse, my entire membership) looking anxiously for familiar faces at general membership meetings, trying to keep my calendar straight (am I supposed to be going to Hutchison? Botanic Gardens? Someone’s house? ), and waving goodbye to the majority of my Monday evenings for the next twelve months? My friends who were JLM actives raved to me about how much I would enjoy the close friendships, the sense of community, and the difference I would feel I was making in Memphis. But the only feeling that seemed to emerge during the first month was “overwhelmed.” New people, new information, and new commitments—everything was amplified. It wasn’t until the September general membership meeting when something clicked. The ensemble from the Memphis Symphony Orchestra joined Angela Hamblen (from the Kemmons Wilson Center for Good Grief) for a reading of her book “What’s So Good About Grief, Anyway?” From there, I was sold. The book reminded me so much of what I had gone through as a child through the loss of my dad, and I realized that I wanted nothing more than to be a part of Camp Good Grief, which is an annual bereavement camp for children ages 6-12. Suddenly, all of my involvement in the JLM made sense. I was no longer overwhelmed; rather, I was ENGAGED. I threw myself into my commitments and enjoyed everything from tours of Regional Medical Center to extra shifts at the Repeat Boutique. I bided my time patiently, and when it came time to list our preferences for placement for the next year, I put Camp Good Grief at the top of my list. 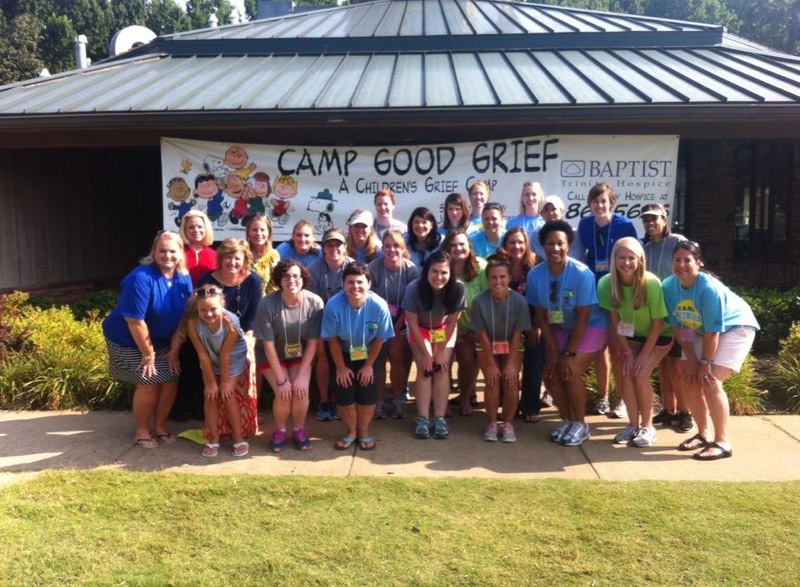 Imagine my excitement when we received our placements—and mine read “CAMP GOOD GRIEF.” Suddenly, however, what I had been hoping for now struck a kind of anxious excitement within me that I couldn’t shake. Now I actually had to go! Candidly? Camp Good Grief was hard. Really hard. It required a massive amount of physical and emotional effort, and I found that the end of each day resulted in a battle between using what little energy I had left to shower off the sweat/sunscreen/lake water/chlorine/bug spray layers or using that same limited energy to eat dinner (the latter usually won). During my drive to the first day of camp, I fought the excitement, anxiety, and vague nausea that seemed to have gripped me tightly. What if I say the wrong thing? What if I cry the entire time? I work with adolescents, so I’m pretty accustomed to mood swings, social politics, and students who act like everything is life or death (you remember being a teenager). These kids, however—their processes and complexities really are life and death. As I arrived, I realized that it was everything you expect from a traditional camp—and then some. There were songs and candy and swimming and games! But the best part of the three days of Camp Good Grief (besides pancakes on a stick) was the feeling you had every time you experienced a victory, no matter how small. Maybe it was a terrified kid finally conquering their fear of the water slide, or the first time your camper grabbed your hand, or watching as a child fully embraced their emotions at the memorial service. Each of these happened to all of us, and I think I can speak for all of the buddies and floaters when I say that each felt monumental in that moment. 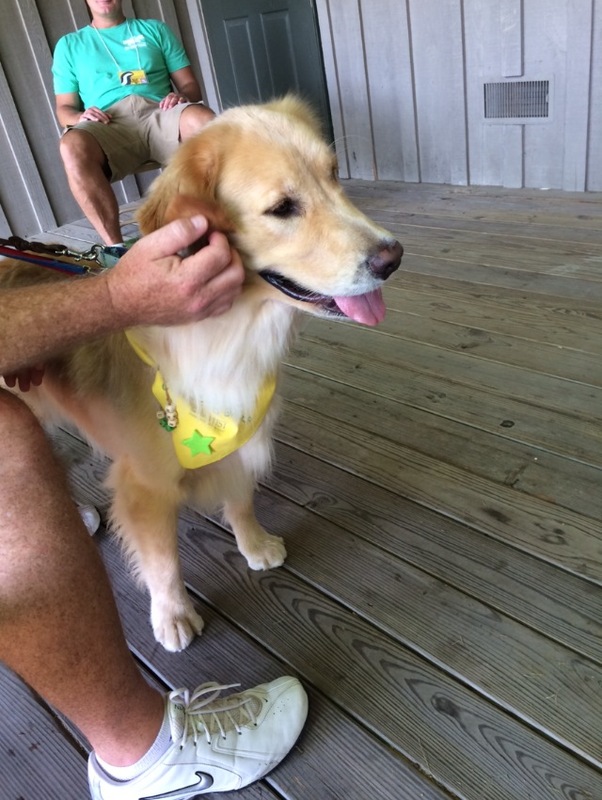 My experience at Camp Good Grief has changed me both professionally and personally. As the Associate Director of College Guidance at St. George’s Independent School, I work with children throughout various points in their high school career, which all too frequently involves the ups and downs that come with being a teenager. During our first training, Angela reminded us, “a bereaved person’s life is like a piece of paper, upon which every caring adult has the dangerous opportunity to leave a mark.” That quote from Dr. Alan Wolfelt stayed with me throughout my entire Camp Good Grief experience. I was constantly mindful of engaging the children positively, being aware and considerate of our conversations, and helping them balance enjoying camp with processing their grief. But now that mindset is also inextricably linked with my daily work, as I employ that same approach with my students. I think my Camp Good Grief experience made me a more considerate listener, compassionate supporter, and resilient volunteer. I learned that you can find strength in vulnerability, fortitude in asking for help, and I embraced the difference that even the most minute connections can make in a child’s life (and in mine). I am counting down the days until next year’s camp. Even if it is not my placement, they will have to close the gates to keep me out—I’ll be there!! Baptist Art of Caring is this Saturday from 5:30-7:30 p.m. at the Memphis Botanic Gardens. There are some incredible pieces up for auction at this year’s event, which benefits the Kemmons Wilson Center for Good Grief and Baptist Trinity Hospice. You can find more information (and the opportunity to buy tickets!) here: http://baptistartofcaring.org/event-details/. 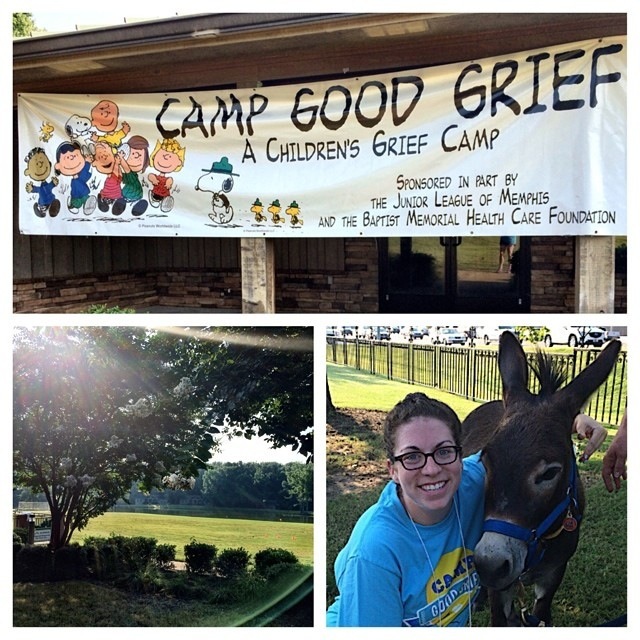 On Sunday, October 5, you will not want to miss the Camp Good Grief 5K, which directly supports this wonderful camp! This family event has food, moon bounces, face painting, and more (including, you know, an actual race)! If you are training for the St. Jude Half Marathon, it’s also perfectly timed for a race-pace 5K—HOW PERFECT!! You can register here: http://campgoodgrief5k.racesonline.com. Year after year, the Junior League of Memphis (JLM) proves to be just as relevant in the lives of Memphis women as it was when we were founded in 1922. This year, a record-breaking number of women signed on to become provisional members of the JLM, so that they can carry on the legacy of being agents of change in our city. 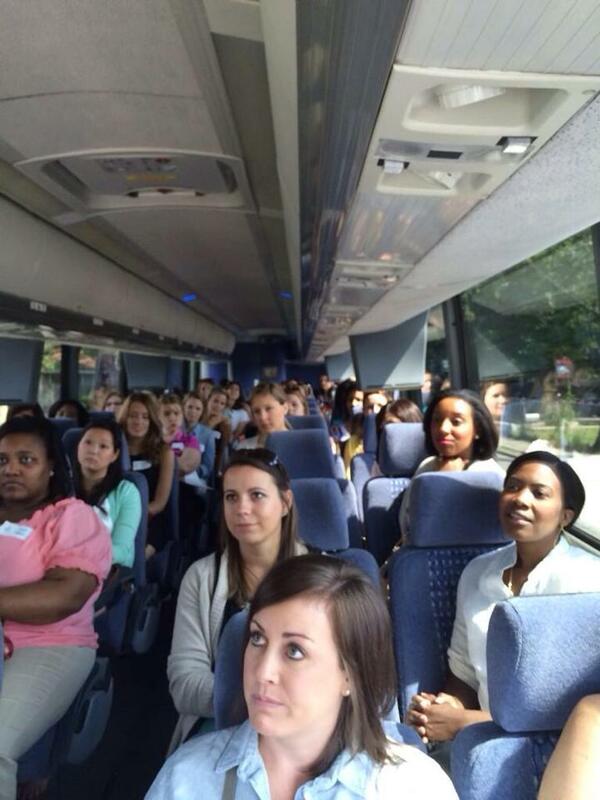 On a sunny Saturday morning in August, more than 100 women kicked off their JLM journey at the Provisional Bus Tour. The tour is an opportunity to get to know other members and learn about community organizations that the JLM is currently working with or has worked with in the past. It’s a unique chance to get a glimpse of how we touch lives before these women get the chance to roll up their sleeves and get to work themselves! Our partner Holiday Deli & Ham Co. helped fuel these women for the day ahead, by providing breakfast at the Community Resource Center (CRC). Jen Larkin, 2014-2015 Provisional Chair, and Carolyn Danley, 2014-2015 President, inspired the Provisionals with a discussion about the JLM mission and the organizations on the tour, and then they were off. The buses departed CRC for the JLM Repeat Boutique, LeBonheur Children’s Hospital or Binghampton Christian Academy. 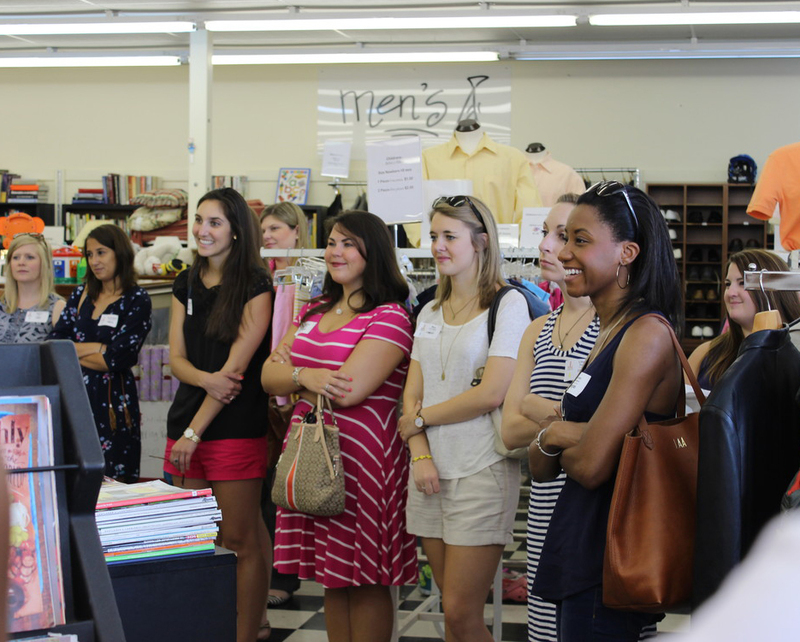 The women learned about how the JLM Repeat Boutique serves the community by providing affordable, gently used items for sale and how we rely on donations from members for continued success. 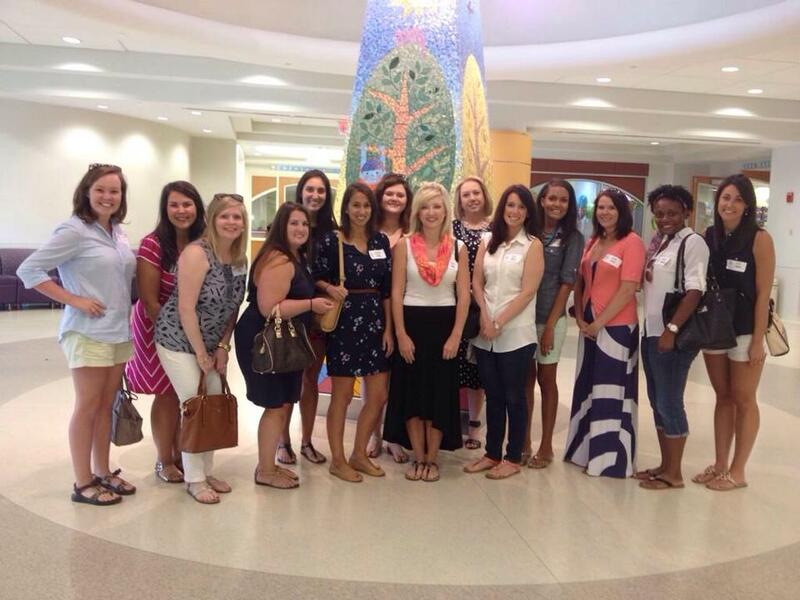 At LeBonheur Children’s Hospital, the women took a tour of the hospital and got to see the learning lab sponsored by the JLM. The learning lab provides resources to help teach parents how to care for children’s specific needs before they leave the hospital and provides education regarding nutrition information, healthy cooking tips, and, for patients requiring medical home care, information about putting in tube and other potential at-home procedures. The Binghampton Christian Academy offers both a Day School and Residential Program, where some of the students can live on campus, in order to be given the opportunity for a more successful educational experience. This school draws a large international crowd of refugees, offering a unique set of challenges that the JLM will help serve this year. These stops provided just a glimpse into the many ways that the JLM touches the community, and Provisionals were able to reflect on the journey on which they will soon embark by meeting with the Board of Directors during lunch. They gathered in the gym of The Salvation Army Kroc Center Memphis, after passing through The Kroc Center Art Gallery, sponsored by the JLM. This new Memphis landmark serves as a health and wellness facility accessible to all citizens, yet another example of our mission of impacting the community in a positive and healthy way. All in all, the day served as a spring board for 150 women who are eager to make their mark and move Memphis forward by joining the ranks of the JLM – so stand back and watch what they will do in the year ahead! The Provisional committee would like to thank the following people for making the day a success: Jourdan Patton, Gracie Tuten, Jackie Jefferson, M.L. Weber, Michelle Connors, Sara Burnett, Tim Flack, Brittany Adams, Jarmeese Morrow, Tami C. Harris, Delois and Travis Crutchfield, Nancy Emmanuel, Katie Dickinson, Andria Lewis, Laura Wymore, Pat Pope, Wanda Brooks, Holiday Ham & Deli Co. and Hogwild Catering.